Just in case you were wondering, the Northwest is awesome and full of amazing produce, farmers, and all things food. That is why we are bringing you to The Ultimate Oregon Thanksgiving Recipe Roundup. A few of my fellow Portland area bloggers and I were asked to join in a radio talk show this Sunday from nine to eleven morning on KPAM 860, hosted by Missy Maki Simple Kitchen. She has put this together so we can share our tips and tricks to make your Holiday season tastier and easier. Being that I am a baker I decided to do a pie. Also this being not just baked, I naturally offered to do a savory dish as well. I love them both! Check out my recipe for Maple Mashed Yams with Toasted Walnuts. Our host Missy Maki from Missymakicooks.com, and radio show host on Simple Kitchen KPAM 860 Sundays nine to eleven am. We were also featured in an article about this on the front page of Food Day in the Oregonian newspaper. Which is so cool and a big deal to us! I love what I do and that I am able to share all that I have learned in school and working in the industry by writing this blog. I am grateful for this awesome opportunity that Missy has provided for us. It is going to be so fun and I hear mimosas are involved. So tune in Sunday morning! There are some things I have learned over the years in culinary school and talking with pastry chefs and bakers that make pie making happy times and not stressful times. Here are a few of those tips to make pie life easier. READ THESE, DO NOT SKIP, THEY HELP, A LOT! Keep all ingredients super duper cold. Place the oven rack on the very bottom. This helps aid in the baking of the bottom crust. Prevents soggy pies. Place pie pan/dough in freezer while prepping pie filling and dough. Read through the entire recipe before you begin, it helps get a sense of how things will flow. 1. 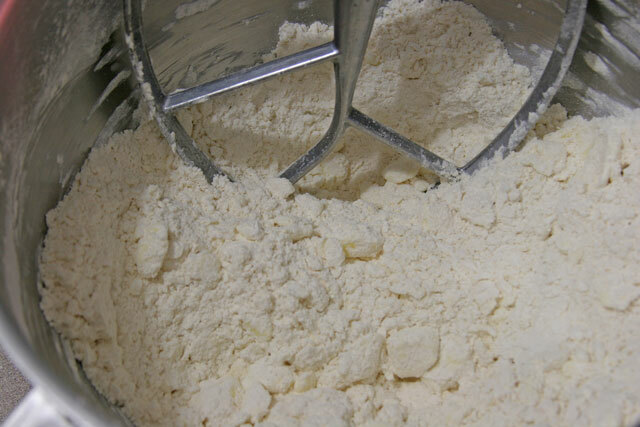 In a bowl of a stand mixer fitted with paddle, or a bowl, place the flour, sugar, salt, whisk to combine. Add butter and turn mixer on to low to combine butter until small pea sized chunks. 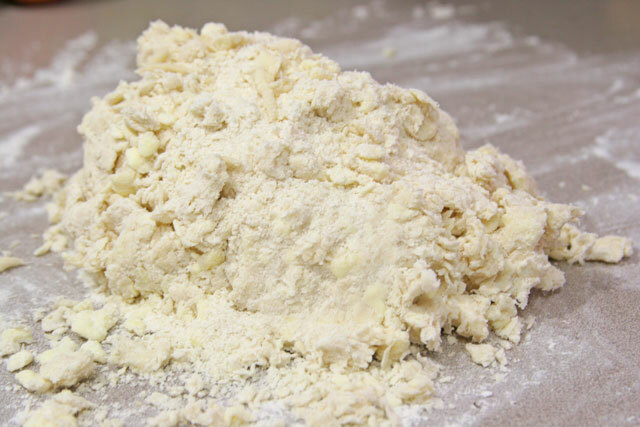 If using hands, rub butter into flour until pea sized chunks are formed. 2. Once you have created small peas sized chunks of butter, gradually add the water on low. If using hand, add water, and use a spatula to gently combine. It will be crumbly. 3. Place dough onto lightly floured counter. Bring together gently using your hands. It will be crumbly, but if it isn’t coming together like below, add a teaspoon of water until it comes together. Wrap up in plastic wrap and place in fridge for 15 minutes. 4. Take dough out of fridge, place on lightly floured counter. Roll out to 1/2 inch thick. Fold into thirds. Place in plastic wrap again and into fridge for 15 minutes. Take dough out and roll out to 1/2 inch thick. Fold into thirds and place into fridge. 5. Take dough out of fridge. 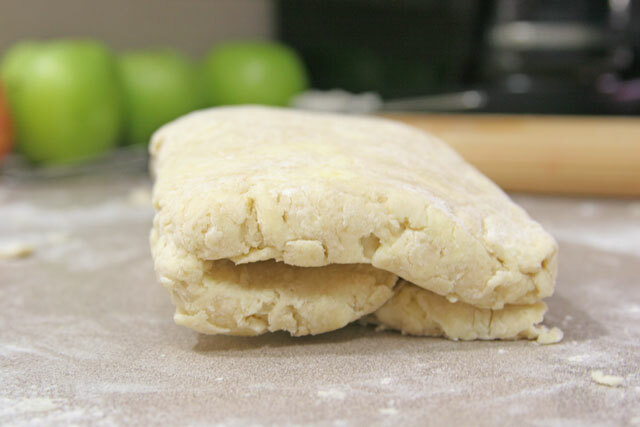 Roll out the dough to 1/4 inch thickness round, or as close as possible. 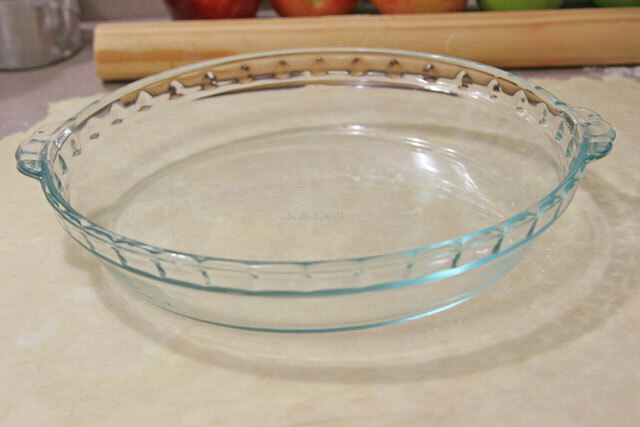 To see if your circle is big enough, take your pie pan and place it on the dough. You will need about 2 extra inches all around. 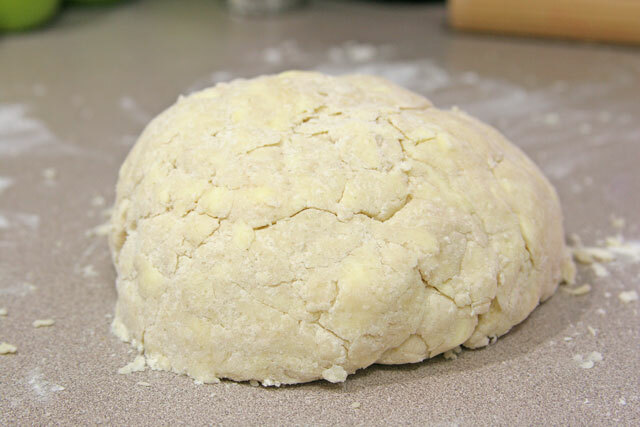 Place a rolling pin on one side of the dough, roll the dough around the rolling pin. Lift the dough to place over the pie pan. 6. Gently lift and snuggle the dough into the corners of the pan. Press gently down on the edge where the sides meet the bottom of the pan. 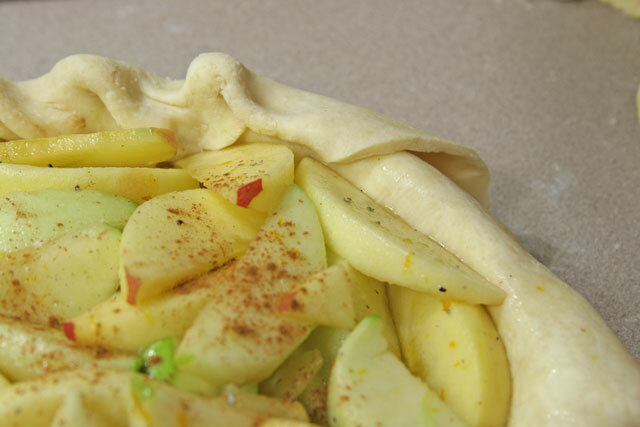 Take a small sharp knife cut off the excess dough to get the 2 inches you will need to make the crust. Set aside extras. 7. 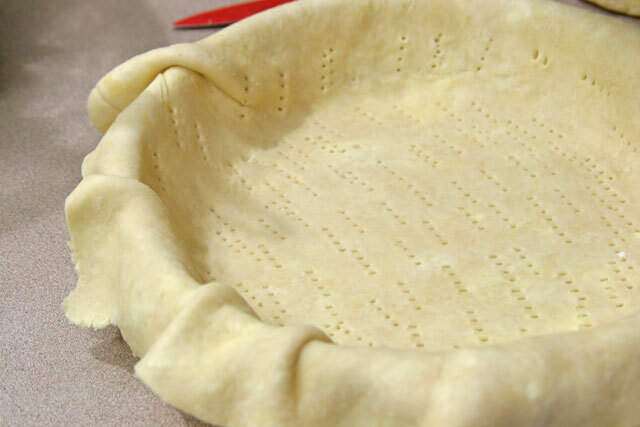 To make the crust pretty take the 2 inch piece of dough, fold it over onto itself to make a 1 inch piece and press down gently on the fold. This makes a naturally next fold to keep going with. Do this until finished all around the crust. If you need more crust, or make a hole by accident, don’t worry. Use the extra you have set aside to patch any holes. 8. Dock the bottoms and sides of dough with a fork. 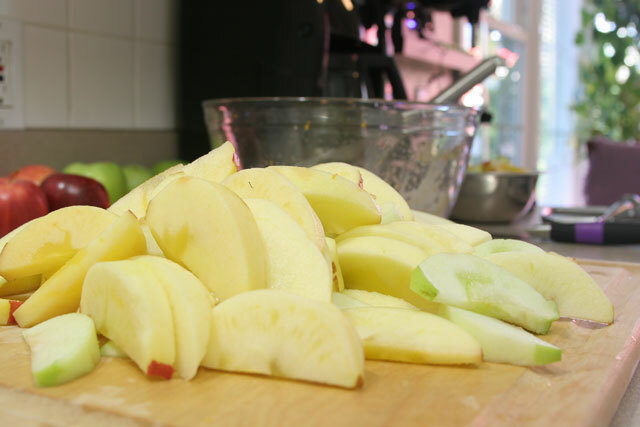 Gently place all of the apples or filing into the pie crust. Brush egg wash on all sides of the crust. 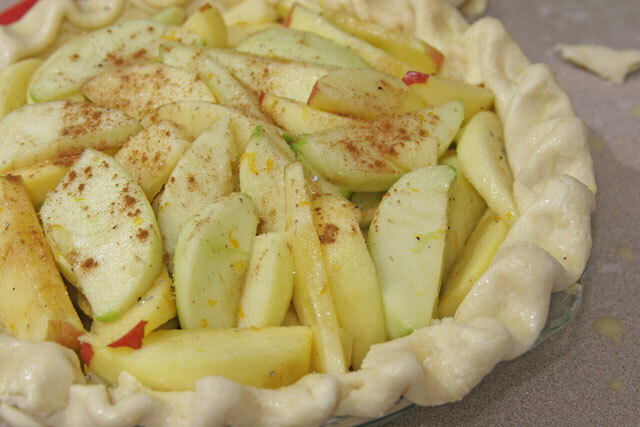 Sprinkle the top of the pie and the crust with 1 tablespoon of sugar. Place in the oven to bake for 30-40 minutes or until golden brown. 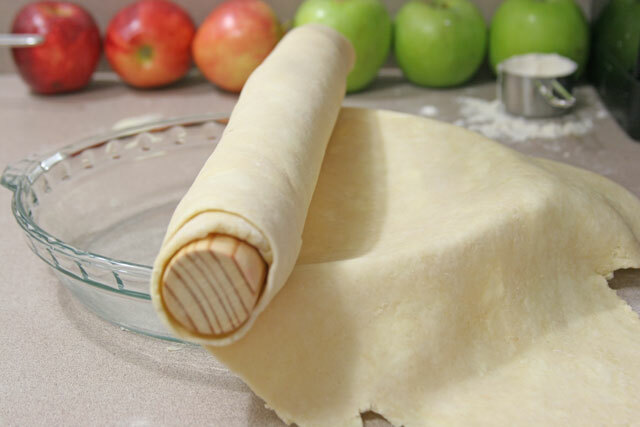 Ok, I must know how you fluted the edges of your pie crust. So blooming cute! 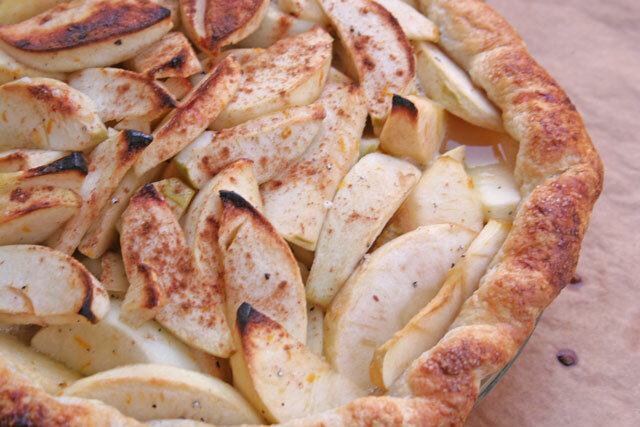 I love the combination of apples and cardamom. Simply yum!